It was soon discovered that Skin-So-Soft green dry oil spray is a natural bug repellant, with the oily consistency and citronella scent it naturally repels insects. This range is used by many sports persons, the army, pet lovers, holidaymakers……there are some great articles relating to its uses, did you know Scottish marines use Skin-So-Soft green dry oil spray!! In 2017 – 55 years after its launch, Avon repackaged the Skin-So-Soft range into the clear bottles and new logo we know today. 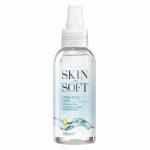 The given uses of Skin-So-Soft are varied….have a browse down the list below….although these are not endorsed by Avon themselves this dry oil spray is certainly amazing!! Delivery – at the checkout select direct delivery for courier delivery to your door in 3 to 5 days. Free delivery on orders over £30. *SSS is approved by the FDA/CDA only as a bath product. Avon does not endorse its use for anything other than a bath oil. 1. It’s a bath oil and after shower moisturizer. 10. Applying SSS over bug bites alleviates itching. 11. Cleans oil and grease off of skin. 12. Painting something? Use SSS to remove paint from the hands. (Instead of turpentine). 13. It soothes light sunburn. 14. Rub hands with it before washing, it helps get them cleaner. 15. Rub on dry, cracked skin…. helps heal skin in 2-3 days. 16. Put 1-2 capfuls in liquid soap and use it for shaving legs and under arms. Helps razor glide and leaves skin feeling smooth. 17. Pour a little into your foot bath to help moisturize your feet while you relax them. 18. It removes chewing gum from hair, skin, and most nonporous surfaces. 19. Cleans permanent ink off stamps. 20. SSS Original Bath Oil works GREAT on Head Lice!!!!! Saturate head and let it set for 15 minutes. Then rinse under an outdoor faucet, but the lice were gone!!!!!!! Of course, shampoo hair a couple of times to get the oil out, but the lice are gone and stay gone! 21. It kills ants instantly. 22. Spray on skin to relieve dry itching skin. Helps skin retain its elasticity. 23. Wash hair with shampoo and conditioner like always and after it dries…. Use about the size of a dime of SSS and rub it in your hair. It goes straight in and leaves hair as shiny as the ads on TV, not greasy at all, just soft and shiny. 24. It can help eliminate psoriasis. 25. It lessens the sting of removing bandages from children’s sensitive skin. 26. It removes gum from hair better than peanut butter. 28. It’s a good wood cleaner and conditioner for natural wood. 32. It’s an oil lubricant for fitting pipe joints that won’t slip together. 34. It cleans heavy oil and grease from nonporous surfaces. 38. Wash cupboards with it mixed in your cleaning water to keep ants off and out of the cupboards. 39. Excellent at removing lipstick stains from furniture, clothing, etc. 40. Use it to discourage hornets from building their nests. After using a hornet killing spray, remove the nest and keep the area sprayed with SSS. They will not rebuild there. 41. Use it to clean leather; it will also keep it soft and supple. 42. Use it on your air conditioning screen (filter)–your incoming air will smell fresher and the filter is easier to clean. 43. Rub all over windowsills to keep ants out. 44. It cleans paintbrushes easily and leaves them soft as new. 45. It removes gum from carpets. 46. It removes scuff marks from patent leather shoes. 47. Use it on running rails for sliding glass doors and windows. 48. It removes “ring around the collar”. 49. It removes liquid nail (paneling glue). 50. Two glass bowls or glasses stuck together? Drizzle a little SSS down the sides and they’ll come apart easily. 51. It removes candle wax from furniture, carpets and clothing. 52. Hummingbird Feeders: To deter bees try rubbing SSS on the feeder surface by the feeder ports. 53. It works for maggots in the garbage can too! You squirt SSS in can and lid, then later flushed with soapy water, and you shouldn’t have any bugs in cans rest of summer!!! 54. It is a great furniture polish! 55. Put it in one of the bottles that you attach to your backyard hose and then spray down the back yard! Will cut down on ants, mosquitoes and other creepy crawlies. 56. People spray it on their rose bushes to keep the deer from eating them, and at the cemeteries on the flowers they put out there for the same reason. 58. It cuts grease and cleans dirt from range hoods. 59. Add a capful to wash water when doing laundry…acts as a fabric softener and keeps the bugs off clothes. 60. Spray on orchids and other flowers for moisture and to keep bugs away. 61. Cleans baseball caps. Just spray on and rub with toothbrush. 62. Try this recipe: mix one part SSS and 2 parts water and spray on tomato plants to keep those ugly old tomato worms off. Spray plants about every 2 or 3 days. Works great!! 64. Use to clean windows. 65. Removes crayon from most surfaces. 66. Screens can be lightly sprayed with Avon Skin-So-Soft green dry oil spray to repel no-see-‘ums and tiny gnats that otherwise might slip though the screens. 67. Another use for SSS is it will kill those pesky earwigs. Spray it on & they don’t return to life. 68. If you ever make candles, melt clear wax and put SSS in it and let it harden. Works great for outside in the summer. 69. As a deodorizer, spray into air and let settle, kills those nasty pet orders. 70. If a child wets the bed, spray the bedding and sheets before washing and will give it a fresh clean smell. 71. It keeps bromine and chlorine from corroding metal and keeps the top of a pool pump filter lubed for easy opening. 72. Use SSS in an oil burner outside to repel bugs. I use the ones with the little dish on top and a tea light below. Just put a capful or so of SSS into the dish and light the tea light. Your patio will smell great; it works better than citronella candles, and no citronella smell! 74. Mix 5 parts water, 1 part SSS and mist on animals. Brushing it in makes their coats gleam and keeps insects off so the animals don’t fidget in the show ring. 75. Mix in your pet’s bath water. It takes the fleas off of them…and in between sprays them with the 5 parts water, 1 part SSS mixture to help keep them off. 76. Rub on your hands before and after working with your pets and farm animals. It will remove the strong smells. 77. Black Fly Spray For Dogs: Use as a spray or a dip. 1 cup SSS, 1/2 cup liquid detergent and 3 gallons of water. 78. For dog’s dry skin mix 1 tablespoon of SSS per gallon of water and use as an after bath rinse. Or spritz your pet’s coat with Skin-So-Soft green dry oil spray once per week. 79. If your dog should get tar or asphalt on the pads of their feet rub on SSS and then wipe off. 80. Flea Bath: Use a flea and tick shampoo. Rinse, rinse, rinse so no soap residue is left. Follow with final rinse of 2 gallons of water mixed with flea dip and 1 capful of SSS. The Skin-So-Soft green dry oil spray helps replace the oils lost in bathing and has the added benefit of repelling insects. 81. Flea Repellent: Avon’s SSS Bath Oil. 1-1/2 ounces per gallon of water; used as a sponge-on dip (or as a spritz) has been tested and proven to have significant, but not complete, flea-repellent activity for a 6-day period. It should help those dry coats, too. 82. It works great on animals with dry skin. 83. Use the following on horses – read the Horse and Hound article here – and on dogs when necessary. 1-cup Avon SSS bath oil 1-cup white vinegar 1-cup (or more) water 5 cc of essential oil of citronella (from the health food store NOT the type you burn to keep insects away that is available in a drug store) Mix in a spray bottle. Straight SSS works well for mosquitoes too but really makes your dog greasy. 84. (Barns) Use as an inexpensive fly control spray or a diluted mix of Avon SSS in water can be sprayed on barn walls and floor to discourage insects from hanging around or to eliminate them before putting in the new bedding. As time permits, and if you can keep your goats out of the barn for a few hours – let the barn stand and air out before re-filling with bedding. 85. Rub on your hands before and after working with pets and farm animals, takes away pet odor. 86. A natural way to help cats with flea problems and flea allergies is to rub Skin-So-Soft green dry oil spray into the skin. Fleas don’t like it either! Spread the word! 88. SSS can be used as a hoof polish. This will put a nice shine to the hoof without drying it. 89. SSS can be used as a muzzle, eye, and ear enhancer. SSS works great and still helps keep bugs away. 90. Horses that have allergies and also get dry skin very easily can get baths in SSS. Bathe her like normal and then put a capful of SSS in a 5-gallon bucket of warm water and sponge this all over her. Her coat dries silky soft and she quits itching. 91. It removes tar spots from the car without damage to the paint. 92. Use it to clean vinyl dashboards, seats, and tops. It not only cleans, but also keeps it soft and helps to prevent any cracking. 93. After washing your car, use it as a tire dressing to keep them looking like new. 94. Put some on a small washcloth and leave in the car to help keep the air fresh and clean. 95. Wipe down vinyl surfaces inside your car. Cleans nicely and removes smoke odors left by cigarette smokers. 96. It gently cleans heavy grease and oil from skin and nonporous surfaces (great for Mechanic’s Hands). 97. It removes tree sap. 98. Prior to traveling…rub SSS on headlights and grill. It makes insects and bugs easier to remove. 100. Spray Skin-So-Soft green dry oil spray on the outside of the tent, especially near the door & windows and it keeps mosquitoes away. These uses are not endorsed by Avon or Makeupinbusiness.